[lauredhel] Oh, those wheelchair users, what hobbies do they – oh. [lauredhel] But they like to SIT, right? How about CHAIRS? [meloukhia] Can always use more CHAIRS! It’s probably just a search generator – it looked for similar items with the word chair in it. See, I think you’re supposed to put the normal chairs on casters. That’s what always happens though, isn’t it? They can’t play to individuals in wheelchairs, because they’re all individuals. 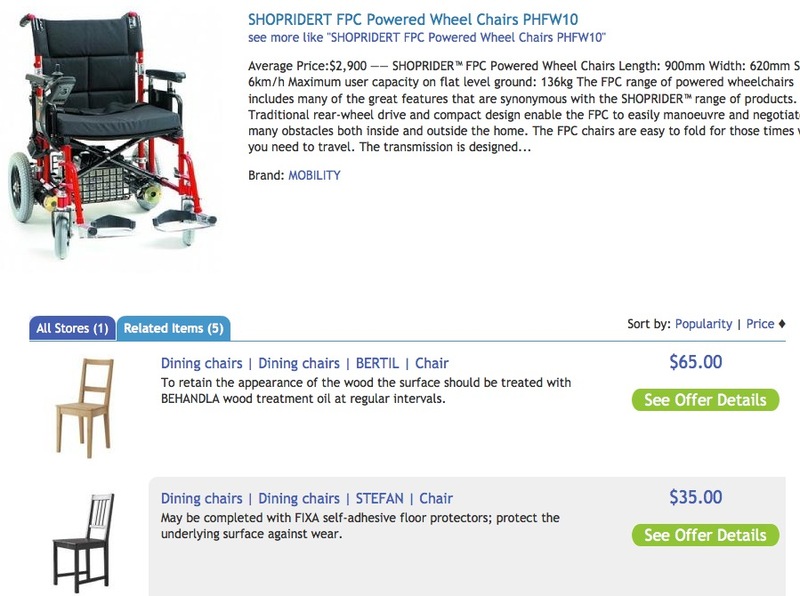 Do you think it would be better if the “related items” were other assistive devices? Yeeees, we know about the word-matching algorithms for Related Items. We still found it funny. I also think it’s auto-generated. It’d probably have been more helpful if it’s one of those “people who bought this also bought…” suggestions. Of course it’s a computer-generated match of the tag “chair”. But it’s still very much in much the wrong category of “furniture”. They really ought to make a smarter algorithm.